That Was Then… Sony KDLV32A12U | What Hi-Fi? 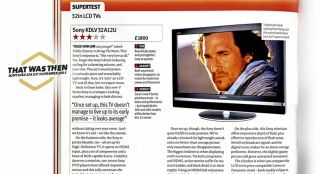 Back in November 2005, our big story was the first-ever group test of HD Ready TVs. We tested eight, from all the big names and all in 32in form. At the time this screen size was massively popular, and about as large as many people were willing to go. Sony’s contender was the memorably titled KDLV32A12U. Our review trumpeted its single HDMI input and was impressed enough to give its component and Scart inputs a prominent mention. We weren’t so taken with its picture quality though, criticising its motion handling and excess of noise. Sound quality was thin and insubstantial. Smart features? Such things were Star Trek territory back then. The cost of all this was a premium, but not outlandish, £1800. Yes. £1800. It seems a huge amount now but this Sony wasn’t even the priciest in the test. JVC – then a major contender in the TV market – offered an alternative 32in for two grand. Today's equivalent would be a set like the Award-winning Sony KDL-32WD603 . It too has an HD Ready panel and, funnily enough, a thin and insubstantial sound. In every other respect it is light-years ahead of the old-timer. Picture quality is excellent: terrific insight, low noise and smooth motion. It’s loaded with smart features and well equipped, for the most part, although we’d like three HDMIs rather than just two. The cost of all this loveliness? £300. As far as TVs go, things have never been better.